Holger Thorsten Schubart: "Neutrinos Are Energy Source of the future." Often doubted and even ridiculed as "ghost particles" in the past, neutrinos are now finally starting to come into the view of the public eye. Recently the revolutionary breakthroughs in neutrino research gained much attention not only at the "Nikola Tesla Forum," but also in countless media reports across the globe. Holger Thorsten Schubart, CEO of the Neutrino Energy Group, summarized the situation in his presentation at this year’s "Nikola Tesla Forum" as follows: "The neutrino particles that reach us in a single day represent more energy than all remaining fossil fuels combined." Nikola Tesla, after whom the American automobile manufacturer Tesla Motors was named, was a physicist and inventor. During his lifetime he was granted over 280 patents worldwide, primarily in the field of electrical engineering. Honoring what would have been Tesla’s 162nd birthday, this year’s forum was held in the historical city of Unterwellenborn and presented a platform for discussions and the exchange of the latest research findings in the field of energy technology. Not surprisingly, neutrinos were once again a main topic of interest. Among the high points of this year’s forum was a presentation made by Dr. Konstantin Meyl, professor for Power Electronics and Propulsion Technology, during which he took the opportunity to introduce his latest book: "Neutrino Power - Neue Erkenntnisse zu physikalischen, geografischen und kosmologischen Zusammenhängen" (INDEL Verlag, ISBN 978-3-940 703-35-4). In the course of his presentation, Dr. Meyl was able to elucidate the activity of these mysterious little particles in detail. He also gave several concrete examples of how it might be possible to tap the energy of the neutrino. "In this book, I have compiled everything that I deem to be of major importance regarding the implementation of neutrino energy," explained Dr. Meyl in a follow-up discussion. As the assistant chairman of the Neutrino Energy Group’s scientific advisory board, Dr. Meyl had often been exposed to the skepticism and criticism that all proponents of neutrino energy once had to face. This, however, changed radically in November of 2015 when the Nobel Prize in Physics was awarded to two researchers who were able to prove that neutrinos do in fact possess mass. Now it has become acceptable to point out the vast possibilities of neutrino energy. Holger Thorsten Schubart explains: "Until quite recently there were many different opinions on the subject and to some extent scathing criticism. But in the end, our approach has proven itself to be correct." Unfortunately, some scientists are still in the "Middle Ages," said Dr. Meyl, and concluded: "The energy of the neutrino is enough to cover the needs of the entire planet." "In only a few decades the earth’s fossil fuel reserves will have been exhausted. Geopolitical conflicts over the last remaining resources and devastating climate change will be the results of our total dependence on oil, coal and natural gas," said Schubart, and he went on to point out that the world’s energy reserves are not distributed evenly, thus allowing a few nations to profit at the expense of the rest of the global population. "The implementation of neutrino energy will herald in a new era for the entire planet," concluded the leader of the Neutrino Energy Group. In the last few days, many respected German and international news sources have been covering the recent successes in the field of neutrino research, including the "Frankfurter Allgemeine Zeitung," the "Spiegel" and the "Deutsche Presse Agentur," to name only a few. One of the stories presently receiving wide media coverage is the so-called "IceCube Neutrino Observatory" in Antarctica. Here researchers are currently observing tiny blue sparks which are caused by neutrinos from the depths of the universe. In an interview quoted in the "Frankfurter Allgemeine Zeitung" Marek Kowalski, the director of the Neutrino Astronomy Department at the "Deutschen Elektronen-Synchrotron," told reporters: "We’re looking, so to speak, directly into the barrel of a cosmic shotgun." In its coverage of the same story, the German magazine the "Spiegel“ spoke of "subatomic particles with enormous energy," thus underscoring the true potential of this research. In the end, there’s nothing "ghostly" about these supposed "ghost particles." Neutrinos are very real, and huge quantities of them pass through the Earth in a constant stream. A surface the size of a thumbnail, for example, is permeated by several billion neutrinos per second. And now that two Nobel Prize laureates have finally made it clear to a doubtful scientific community that neutrinos possess mass, researchers are starting to comprehend the true potential of these limitless subatomic particles as a power source. 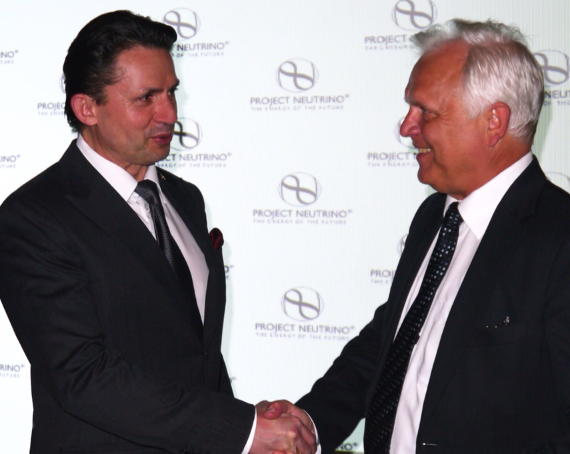 Exploring the possibilities and finding ways to develop this potential are the two main goals of the Neutrino Energy Group.